Banks can no longer base their strategy on financial indicators only. 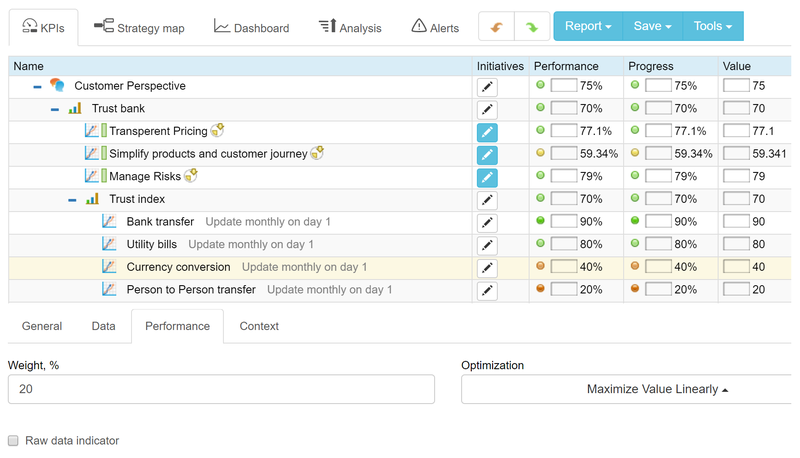 In this article, we will build a Balanced Scorecard for a typical retail bank. We will analyze emerging trends, possible response strategies, and relevant KPIs. Let’s have a quick look at the emerging challenges of a retail bank. Any business is about trust, and retail banks are losing points. Provide better user experience via smartphone apps and modern websites. Have a more transparent and, in many cases, more competitive pricing. Take money transfer, for example, where the adoption rate of FinTech increased up to 50% in 2017 with 67% anticipated for the next periods. Gain a part of customer’s trust by sharing unbiased financial advice via excellent online content. Understand customer needs and behaviour faster and more effectively having a big-data mindset in their DNA. Still have a power of brands and offline presence. Still win in the niche of “keeping money safe” services. What strategy can a financial organization develop to address these challenges? How can you describe and translate this strategy across the organization? How can you execute this strategy successfully? One of the proven options is a Balanced Scorecard approach. Below, we will discuss how to capture the most important goals on the strategy map and track their execution by finding the best Key Performance Indicators. Let’s map the typical challenges mentioned above to the Balanced Scorecard strategy map. 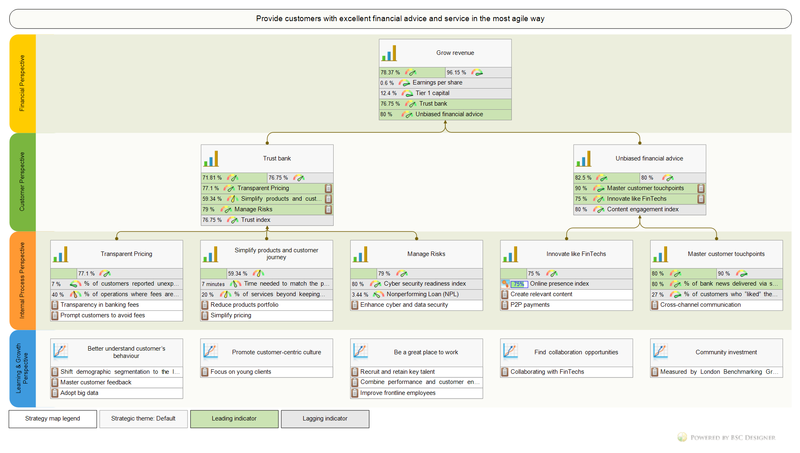 I’m going to use BSC Designer software to map the goals and align KPIs with them. At the end of the article, I’ll share the resultant strategy map as well as the BSC Designer scorecard. Feel free to use it as a template for your own scorecard. Banking Scorecard online, sign-up with a free account to unlock all functions. An inspiring mission statement is a must for a strategy map. In looking at the emerging challenges, we can conclude that a mission statement that focuses only on “keeping money safe” would be outdated. The focus has shifted from providing basic banking services to gaining trust and building a deeper relationship with clients. 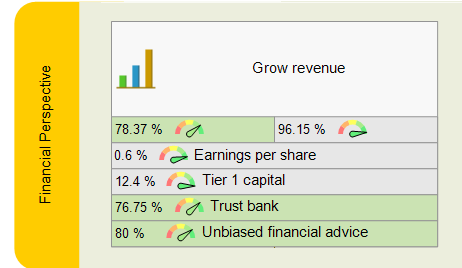 ING did even more; they formulated their mission as “empower people to stay a step ahead in life and in business.” And they actually track and report on the number of empowered customers (see the bank’s reference for the full list of ING’s KPIs). Tier 1 capital = Equity Capital / RWA (Risk-weighted assets). Bank’s core financial measure from the regulator’s point of view. Return on Equity (ROE) = Net Income (Annual) / Shareholder’s Equity. Shows how well a bank uses investments. Similar to ROE: ROAE – Return on Average Equity. Return on Assets (ROA) = Net Income (Annual) / Total Assets. Shows how well a bank uses its total assets. Net Interest Margin (NIM) = (Investment income – Interest expenses) / Average Earning Assets. Shows how bank assets are performing. Nonperforming Loan (NPL) = Nonperforming loans / Total loans. The loan can be considered as non performing if the regular payment deadline was missed by 90 days. The benchmark value varies depending on geography. The world’s average in 2017 was 3.44%. Net Charge-off (NCO) = Total amount of loans in charge off / Total Loans. Shows the percent of debt owed to the bank that is unlikely to be recovered. Loan-to-deposit Rate = Total loans / Total deposits. Shows the bank’s ability to cover withdrawals. Efficiency Rate = Operating (noninterest) Expenses / Net Revenues. Indicates expenses as a percentage of revenue. It also makes sense to look at the metrics used by various bank rating methodologies. For example, Moody’s Bank Rating. The best approach for the KPIs (including financial ones) would be to formulate your strategy first, and then try finding the right way to measure it. I’ll demonstrate how to follow this approach below, and we also have a KPI System that helps to find the best KPIs for the most challenging business situations. I would like to warn business professionals from copying the KPIs from some long lists. KPIs that are not aligned with an organization’s strategy will do more harm than good. Still, in many cases, it’s a good idea to review what metrics other players use. For this purpose, at the end of the article, I’ll share a list of the largest banks with references to their KPIs. How to Quantify and Measure Trust in a Financial Organization? as authors of Banking System Trust suggested. It is perception-based, not action-based. People might rate their trust to a bank highly but still move their money to another financial institution. It is lagging in its nature. It tells us a story of what has happened but doesn’t give a clue how to change the situation. If we want to address the “perception” problem, we need to formulate the questions that allow focusing on the action (more objective) part of the trust: if people don’t trust some operations to the bank, they fulfill their needs in some other way. What financial services have you used within the last three months that were not provided by the bank? The weighted average of the values of all metrics, in this case, is 70% which gives us a number for the bank trust index. In this example, we see that the bank did not gain the trust of its customers to provider P2P transfers, but the weight of P2P transfer in the total trust index is low. Following the example, if P2P payments become popular next year, then the bank will need to reflect this in the weight of this factor in the index, and respectively try to gain customers’ trust to provide this service. While it is useful to have these metrics on the corporate dashboard, their lagging nature might be a problem. For example, decreasing customer retention is a very strong signal, but it might be too late to rebuild trust with customers. What about “Unbiased financial advice” goal? The leading part will be connected to the lagging indicators from the “Internal” perspective. What about the lagging part? How can we validate if customers are contacting the bank for financial advice? The lagging part will depend on the results from the “Internal” perspective. Instead of looking at short-horizontal lagging metrics, we will need to understand the long-term impact of the goals from the Internal perspective. A short-term lagging metric (a process output), for example, the number of qualified blog posts (appropriate words count number, relevant topics, good writing style) created quarterly. A long-term lagging metric – engagement index, that can include social media metrics, such as average reading time, % of re-shares, and likes. The short-term lagging metric will tell the bank’s team if they did a good job creating content; the long-term lagging metric will work as an indicator of a long impact. Following this logic, we can align the Content engagement index (a long-term lagging metric for “Create relevant content”) with the “Unbiased financial advice” goal as a lagging metric. ING is an excellent example of how a bank can convert the idea of giving unbiased financial advice into practice. They focus their activities on financial empowerment. They do it by supporting various initiatives from helping deaf customers to providing forecasting tools. The “Number of customers that felt financially empowered” is reported among other non-financial metrics in their annual report. It also makes sense to discuss who are the customers of the bank. Internal Perspective, we discuss how the needs of the customers can be fulfilled. A response from the bank should focus on these factors. I believe most banks already have their pricing information available to the customers, but here we are talking about easier access to this information at the right time. As a customer of a bank, have you ever faced a situation when you saw some “fee” in your monthly statement, but you had no idea why you had it there? The FinTech app calculates and shows a transfer fee beforehand. In the case of bank transfer, the fees will be seen a few days after the transfer was made. Use this card at least 3 times within the quarter and it will be free for you. They also prompt you about upcoming fees and explain how to avoid them. In the case of the bank, that’s a great opportunity to be more transparent with their clients. In this case, the optimization of the metric is “less-is-better.” We aim to minimize the value of the indicator to achieve the “Transparent pricing” goal. Respectively, the less fee problem customers have, the better the performance of the goal. In my case, BSC Designer does all the necessary calculations for me. As we discussed before, complexity is an important factor in customer engagement. Let’s think about complexity in the context of retail banking. Banks tend to overload their portfolios with similar products that are hard to compare and contrast by the customers. When Apple faced a similar product line complexity problem, Jobs asked his top managers – “Which ones do I tell my friends to buy?” Without having a satisfactory answer, he reduced the number of products by 70%. Measure time. Time that managers need to match the product with the customer needs. Time that customers need to choose the best product. Measure the connections/components/levels. Is the offer explained on a single page? Are there many references to the conditions that customer need to satisfy in order to have this product or to have it for free? Track “Shortest message length” (that’s what Steve Jobs did asking “Which ones do I tell my friends to buy?” question). How many words does the bank’s manager need to explain the detail of their offer? % of services beyond keeping money safe. If the bank’s strategy in simplifying product portfolio was a success, managers will see that customers are more willing to contract services beyond basic bank service (e.g. keeping money safe). Another goal that supports the “Trust” goal is effective risk management with “Enhance cyber and data security” initiative. 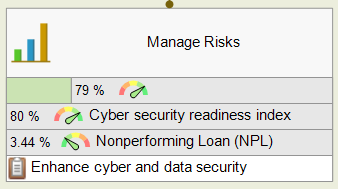 Most banks do regular risk assessments to identify potential threats and vulnerabilities. Implementing near miss reporting is a good idea in terms of cybersecurity readiness. 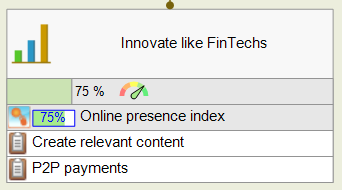 FinTech companies are definitely better communicators than classical financial organizations. More initiatives can be aligned with this goal after a SWOT analysis of the bank’s product offer. As an example, I’ve added P2P payments. It was mastered by the Bank of America (see the shareholder’s report for 2017), but the biggest Spanish banks are still losing the battle to FinTechs. Looking at the innovation challenge in general, I would say that banks need to adopt a more agile innovation framework. “More agile” in this case means being more systematic about filling in the ideas pool and converting more ideas into the tested and prototyped offers. 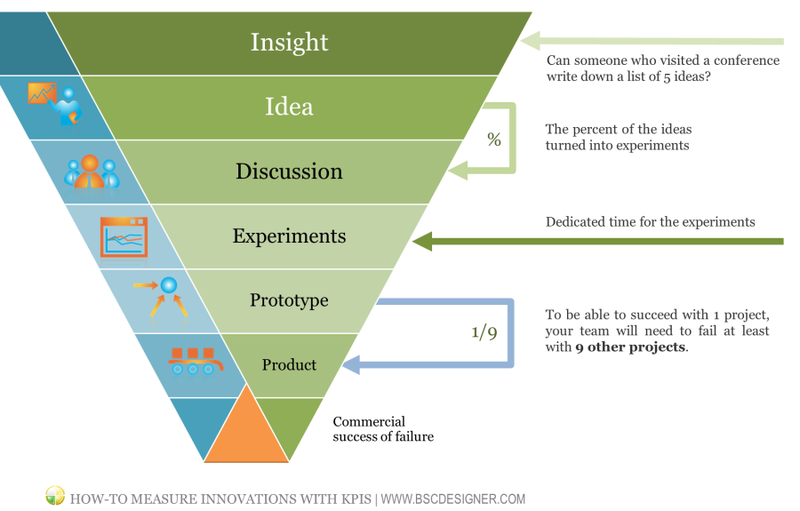 Here you can find some specific KPIs to measure innovations. 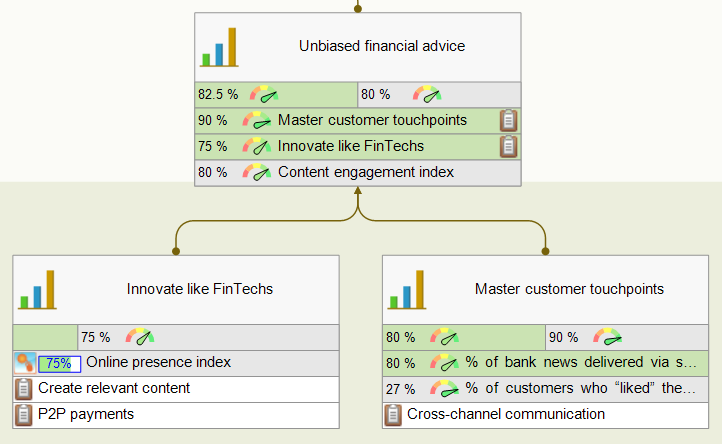 Both “Innovate like FinTechs” and “Master customer touch points” goals are aligned with “Unbiased financial advice” from the Customer perspective. We have discussed the innovation challenge above; it’s about providing customers with the information and product that fulfill their needs. Visiting the bank’s branch is the less preferred communication option by the young generation. Calling a customer by phone might be easy for a bank manager, but it won’t impress tech-savvy clients. FinTechs organically communicate with their customers via smartphone apps and websites. Should banks follow the same trend? It depends on many factors. Start with mapping the touchpoints that the bank has with its customers and develop an improvement plan. 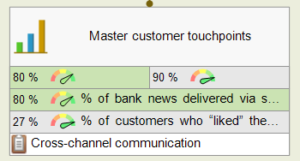 Compare the preferred communications channels with the bank’s ability to use them and with actual usage data. For example, the bank’s target group are young customers who prefer receiving general news via social media. It’s a good idea to benchmark engagement metrics for social media with other communication means (for email, these could be the % of opens and click-through rates) as well as with FinTechs competition (App installs, social media page likes, etc.) See the social metrics article for more metric ideas. All these goals contribute to the goals in the Internal perspective. We can link the goals on the strategy map or map them without the links to underline the idea that all learning goals are success factors to all goals from the Internal perspective. Let’s review these goals one by one and try to come up with some performance metrics. For a long time, banks relied on the classical demographic model that included such parameters as customer’s age and wealth. This worked well decades ago when an average person could have lifelong employment, didn’t buy online, and rarely traveled to another country. A better approach should be based on an analysis of a customer’s financial and technical habits, as well as lifestyle in general. Big data gives necessary technical means for this, but it’s not sufficient to accumulate large volumes of data; the bank manager should be able to formulate the queries of interest to the data specialists. From the viewpoint of performance measurement, the big data efforts can be successfully quantified and measured. 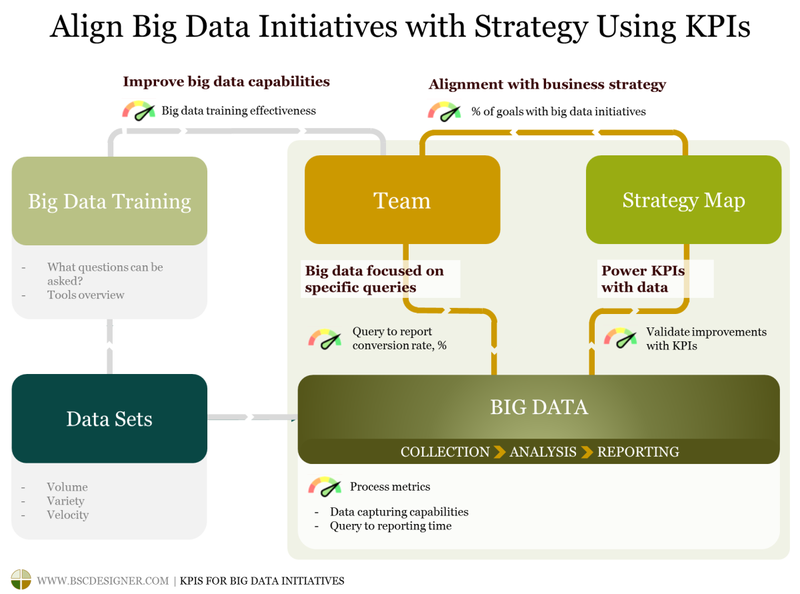 You will find specific metric examples in the “KPIs for Big Data Initiatives” article. A customer-centric culture is about establishing business habits that focus on customer needs, not on achieving short-term financial goals or keeping performance indicators in the green zone. Most likely the financial organization already has some system to get regular feedback from their clients; the challenge is to update this system to fit with the fast-paced modern world. 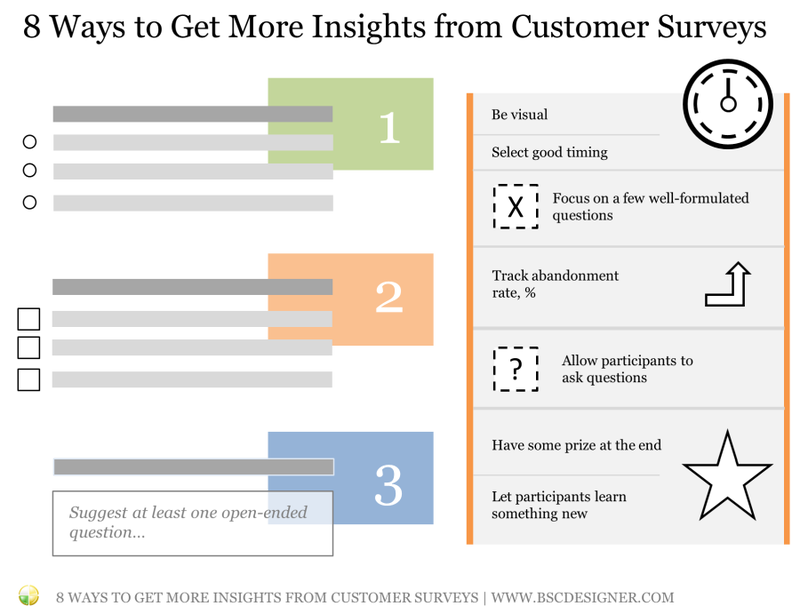 I’ve shared some specific recommendations in the customer surveys article. Bad KPIs can harm a lot – we saw this in the Wells Fargo case. Bad KPIs are shifting employee behaviour from “serving clients” to “fulfilling KPIs.” The solution is to replace old performance measurement habits with more effective ones. We discuss the detail in “5 Steps to Establish a Good Performance Measurement Culture” article. All financial organizations that I reviewed for this article had talent-related goals on their strategies. Goals of a bank are similar to ones formulated by any other businesses – attract, develop, and retain talents. We’ve analyzed in detail the HR-related challenges and KPIs in the “HR KPIs and Talent Strategy Scorecard” article. I would recommend linking the bank’s top-level strategy scorecard to the Talent scorecard as described in the article. Using BSC Designer for scorecard automation, we can easily do it by creating an imported indicator and linking it to the appropriate metric in the HR scorecard. Many financial organizations still struggle to formulate their FinTech strategy. Should the bank have an app for a smartphone? I guess, the answer is obvious today. And probably, its business logic should be developed 100% inhouse. What about blockchain, sharing economy or customer intelligence? The solution in these cases might be about finding collaboration opportunities with FinTechs.Here in Spain, BBVA has the fame of innovative bank, their experiments with blockchain look promising. Supporting community goals is a strategic goal shared by most banks. The forms of investment in the community vary from supporting local business communities to financing affordable housing. Many financial organizations (see, for example, Bank of America, ING, or Santander) aligned their community goals with UN Sustainable Development goals. From the viewpoint of measurement, it might be hard to quantify and compare the impact of these investments with other organizations.One of the popular approaches, in this case, is the London Benchmarking Group (LBG) methodology that helps to measure corporate community contribution using a standardized framework. For example, the Santander bank used this framework to measure their social impact. Banks have to embrace the emerging challenges in the financial domain provoked by the changing needs of the customers and competition from FinTechs. Many banks did a great job of simplifying their product portfolio, achieving transparency in fees, and better communications with their clients. FinTech companies have a lot to offer the end users and are getting much more attention from tech-savvy clients. A good strategy for both banks and FinTechs is about finding partnership points where banks can leverage their brand and offline presence, while FinTechs can contribute with technology and experience. In this article, we analyzed key trends and created a Balanced Scorecard for a bank to illustrate a possible response strategy. Besides the strategy aspect, financial organizations have to improve their performance measurement culture to avoid costly errors of using bad KPIs and give their employees a better idea about organization’s goals and the ways to achieve them. Banking Scorecard discussed in this article as a starting template for your own scorecard!